The Socorro Mission, Nuestra Senora de Limpia Concepcion de Los Piros de Socorro del Sur (Our Lady of the Immaculate Conception of the Piros of Socorro of the South), was established in the late seventeenth century by Spanish missionaries in attempt to Christianize the Piro Indians. The Socorro Mission remains a functioning Catholic parish and is open to the public. The mission complex includes the mission, the Lourdes Grotto, old and new cemeteries, the Parish hall, grounds and the one-story adobe rectory. 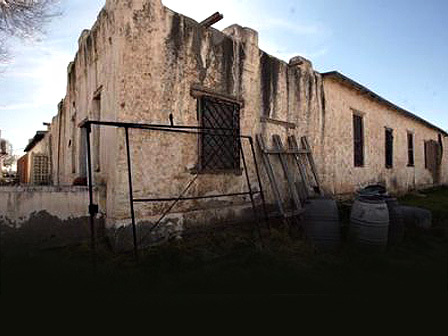 The 1840s rectory is the only surviving example of a Mexican/Territorial structure intended for use by a parish priest in the West Texas/Southern New Mexico/Northern Mexico region. Thought to have been constructed in an L-shape, the rectory now has a square floor plan with a center courtyard. The building is in poor condition due to moisture entrapment and differential movement caused by the application of cement-based products beginning in the 1920s. Cracks and fractures are visible in the interior and exterior stucco surfaces. After completing the restoration of the Mission several years ago, the parish has focused its attention on the restoration of the rectory. Fundraising for this ambitious plan is proceeding slowly and is a difficult task for the small Socorro community.